Hi friends! 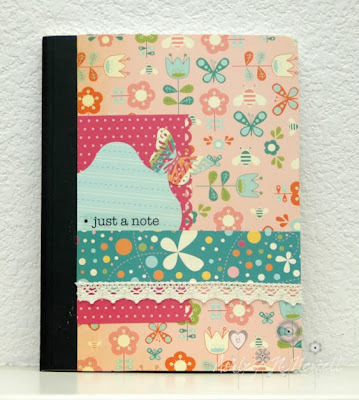 Today, I'm sharing a notebook I made for the Love My Tapes blog. Altered notebooks are great to give as gifts or part of a gift. You can make any size and customize them for the person you are going to give it to. I used the Love My Tapes Lace Tape in Beige. The lace tapes are a perfect embellishment from notebooks because they are flat and adhered all the way down so they will not catch things when you place your notebook in a purse or a backpack. The paper is Cosmo Cricket and the sentiment is an SRM sticker. I love this Cosmo Cricket line! Your journal looks great!